Rose's is a traditional cob built cottage which has been carefully enlarged and improved by the present owners in recent years to create comfortable and stylish holiday accommodation which has been awarded 4 STAR rating with QUALITY IN TOURISM. 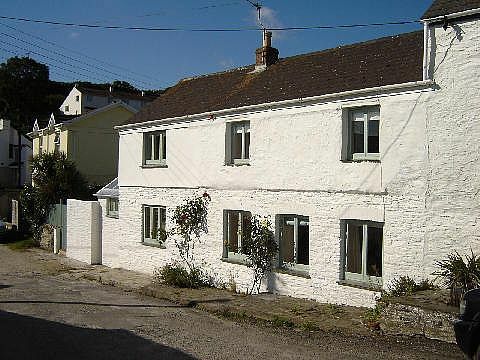 Situated in Highertown which is a private road just behind the Square in Portscatho, the cottage has a sunny south facing aspect and is just a few minutes walk from the centre of the village, Tatam's beach and the harbour. There is parking immediately outside for 2 to 3 cars, and additional parking nearby in the public car parks by the Memorial Hall and off New Road. Access to the cottage is by a picket gate to a secure and sheltered decking area and the front door. The entrance hall leads to a large well fitted kitchen with electric oven and hobs ,fridge freezer, dishwasher and microwave. The kitchen incorporates a large conservatory which serves as a dining area with seating for 6 and French doors lead back out on to the decking area, which if opened allow the seating in the dining area to be substantially extended. Also off the entrance Hall are a shower room with WC and a scullery with washing machine, second freezer and clothes drying rack. There are Cornish Slate floors throughout this part of the cottage. Leading from the kitchen is a spacious living room with comfortable seating for at least 8 people, a stone fireplace with fitted electric stove, writing table and a TV and DVD player. A dog leg staircase leads to the First Floor where there are 3 good sized bedrooms, 2 having king size double beds and the third having 3 single beds, 2 of which can be used to form a double bed if required, the third is a bunk bed suitable for children only. There is a very stylish bathroom with large shower cubicle, roll top bath. hand basin and WC. Central heating is provided by an oil fired boiler in the scullery. Outside, there is a useful store room for wellies and beach gear and which also includes a tumble drier. Adjoining the decking area is a raised garden, with palm tree and various herbs. A gas fired barbecue is available for guests' use. WiFi and landline are available. About the owner: Lives in Somerset. Year purchased: 2007. Unique benefits of the property: The property sits just behind the main square in Portscatho so all amenities in the centre and the beach/Lugger are just a minute walk away. The property benefits from private parking for 2 cars which is almost unique for centrally located properties. This is our family holiday house. Our children and grand-children use the house for their annual holiday so inside is fully set up for family needs. Thoughtfully equipped for a family holiday, the cottage feels welcoming and comfortable whilst still being smart and spotlessly clean. We loved sitting out on the decking in the evenings and were a stone's throw away from the village shop, pub, bistro and Harbour club. A beautiful cottage in a great location -loved Portscatho, such a pretty village and very friendly- you must visit the Harbour club which is the social club in the village and for a small fee you can access. Watching the sun go down from their balcony is a must. A short walk to The Hidden Hut on Porthcurnick beach, again great atmosphere and food. Towan beach beautiful and our favourite- white sand and turquoise sea and a great tea van in the courtyard behind beach. Also kayaked and sailed from St Mawes, a short drive away. In all a great holiday in a beautiful part of Cornwall, we were very sad to leave and will definitely return as we ran out of time to do everything! Would definitely go back to Portscatho as a base, a really special village and a lovely cottage to stay in. It’s so very nice to have quests such as Jackie who are appreciative not just of our cottage and the efforts we have made to ensure it is as near perfect as possible,but also of Portscatho and the Roseland and everything it has to offer. Many thanks Jackie and come back soon! Wir hatten eine herrliche Zeit auf der wunderschönen Roseland Peninsula. Das Roses ist das perfekte Ferienhaus. Es ist sehr gemütlich und liebevoll eingerichtet. Das Cottage ist mehr als komplett ausgestattet, so dass es uns an nichts gefehlt hat. Von der Angel bis zum Backofen ist wirklich alles vorhanden was ein Haushalt so braucht. Portscatho ist ein zauberhafter Ort und seine Bewohner sehr nett und äusserst hilfsbereit. Portscatho is located on the Cornish Coastal Path making Roses the perfect location to explore the Roseland peninsula. Portscatho has a small, sandy beach just off the main square, approx 90m, 2 minute walk away. Porthcurnick beach is located just a 10 minute walk halfway around the bay. Porthcurnick beach is much larger and has ample space for all. Cornwall is served by Newquay airport. This is approximately 45-60mins away. Portscatho is served by Greyhound Buses but ideally a car is required if holidaying here. Portscatho village centre is less than a minute walk away. Portscatho has two pubs, the popular Plume of Feathers in the village centre, a stones throw from the water, and The Royal Standard, situated up the hill in Gerrans. Both pubs offer good food and a great atmosphere and get very busy in the summer months. Portscatho has an array of shops. All are centred around the main square and narrow streets behind. Ralph's store is a small supermarket but caters for all needs. Fresh bakery items are produced daily ranging from scones and cakes to pies and pasties. Portscatho also has a Butchers shop located behind the pub. There are also various antiquity shops selling everything from knick knacks to fine art. A Post Office is also located in Portscatho and can be found at the top of the slipway. The Post Office is also a small shop selling beach and sea side items ranging from postcards to fishing tackle. Portscatho also has several art galleries, including the Spindrift Gallery located in the main square. Portscatho has a variety of restaurants. The Boathouse is in the heart of the main square and caters for a whole variety of tastes from tea and cake to evening fine dining. The Driftwood Hotel has its own restaurant which is renowned for fine dining and regularly features in National Good Food Guides. The Rosevine Restaurant is also highly recommended. The restaurant has a relaxed atmosphere and the dishes are cooked simply, with what’s in season and using as much local produce as possible. For an altogether more informal and different dining event, the Hidden Hut is a small cafe with a big difference. Booking Notes: Deposit required upon booking. Full payment by 3 weeks of rental commencement. Changeover Day: Weekly rental only - Saturday to Saturday. Arrival after 3pm, check out by 11am.